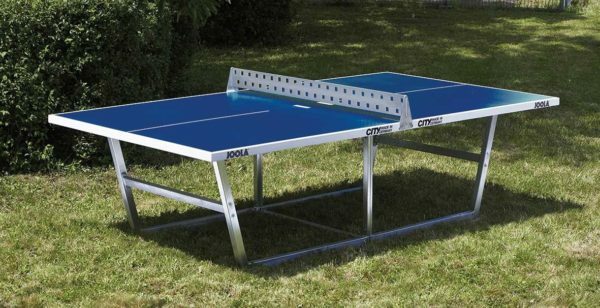 When it comes to outdoor ping pong tables that are perfect for places like city parks, campgrounds, or schools, the JOOLA City is a great choice. The JOOLA City outdoor table is designed to withstand any weather conditions and will hold up to constant use. 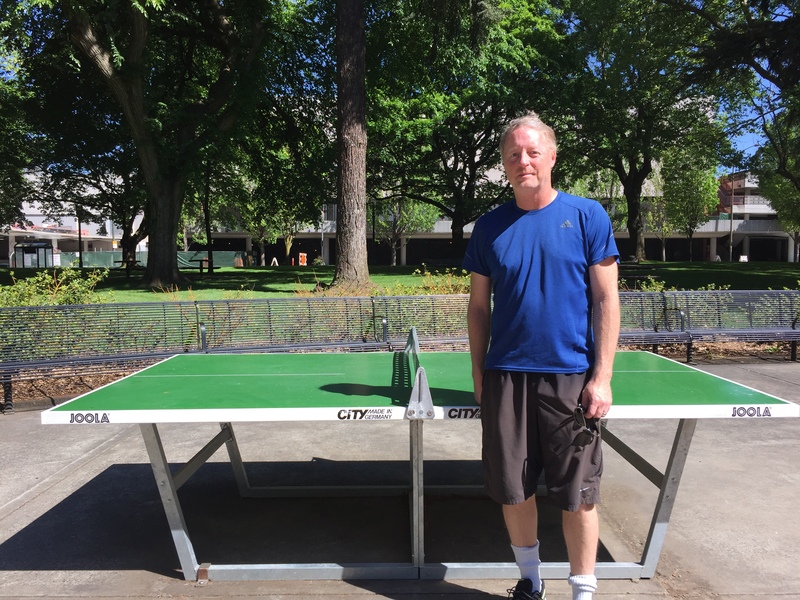 We were able to use two of these tables recently in downtown Portland, Oregon where they have placed them at Holladay Park. Much like Bryant Park in New York City that has the same tables, Portland wanted to create a friendly environment at the park. Our staff played on the table for 2 hours in Portland and the review below is what we found out. 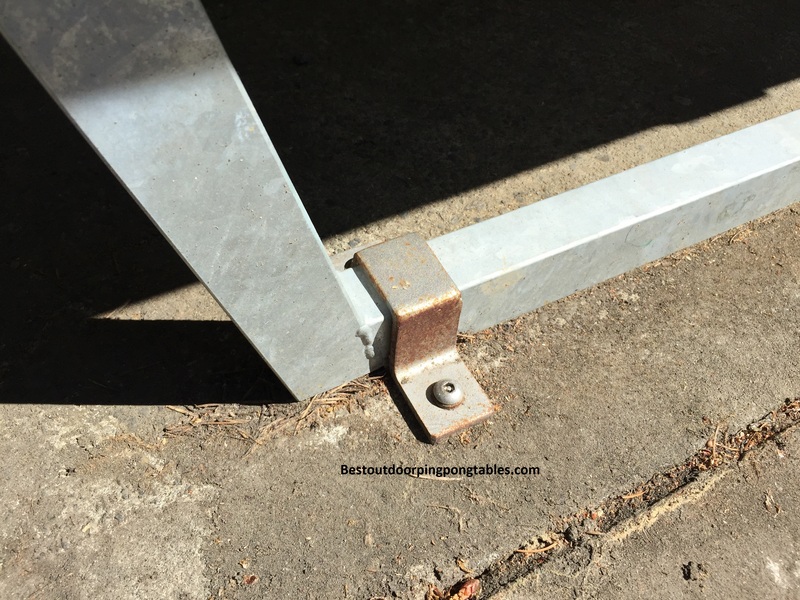 Design/Frame – Very nice undercarriage designed with steel rectangular tubing that has been hot-dip galvanized. The frame will last for years in rain, sleet, snow, sun, etc. 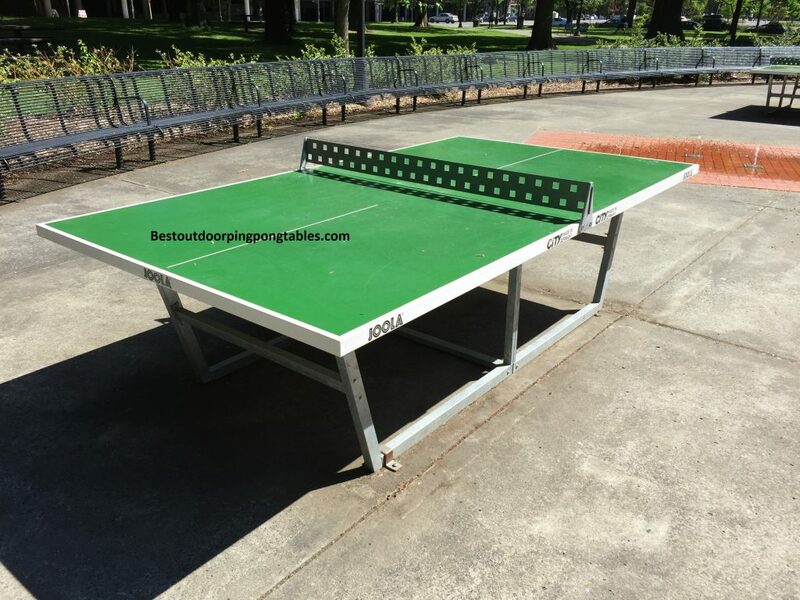 Portland did their research and with our notorious rainy weather, they went with a solid outdoor ping pong table from JOOLA. The JOOLA City features an industrial metal frame that is stable and durable. The only drawback to these style frames (not adjustable like some other tables) is that you will need to make sure the table is placed on level ground. You can’t just adjust the legs to level out the playing surface like you could with the Cornilleau 500M. The only other table that we would recommend for city parks is the Cornilleau Park Outdoor or the Cornilleau 510 Outdoor. Both of those tables can be found in cities like Seattle and London. 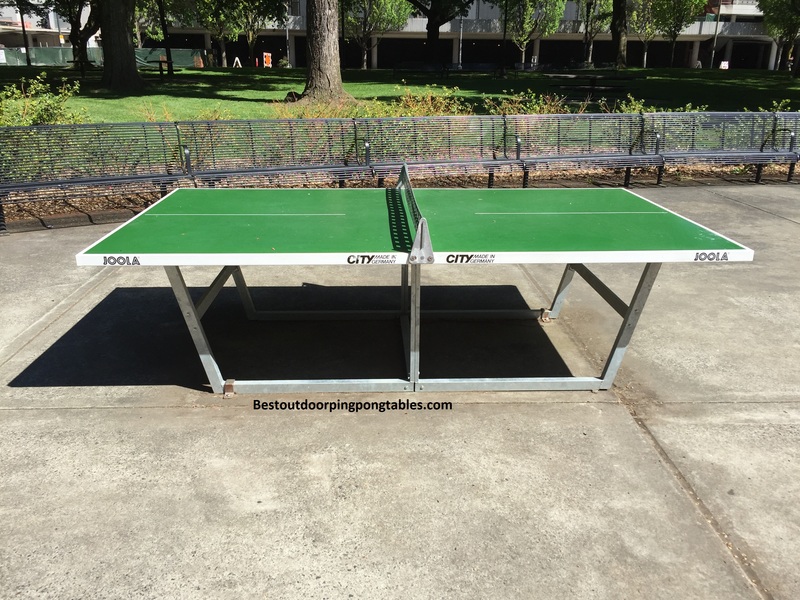 Tabletop/Playing Surface – Thickness is the key to any good ping pong tabletop and JOOLA did not disappoint. The JOOLA City features a 22mm (7/8 inch) tabletop that is coated with a layer of acrylic resin/silica. This mixture makes the top very even and completely free of pores so water will not get into the material. You get a quality ball bounce and a tabletop surface that can withstand moisture. Our only complaint is that the glare from the sun on the green surface can be a little distracting at times. 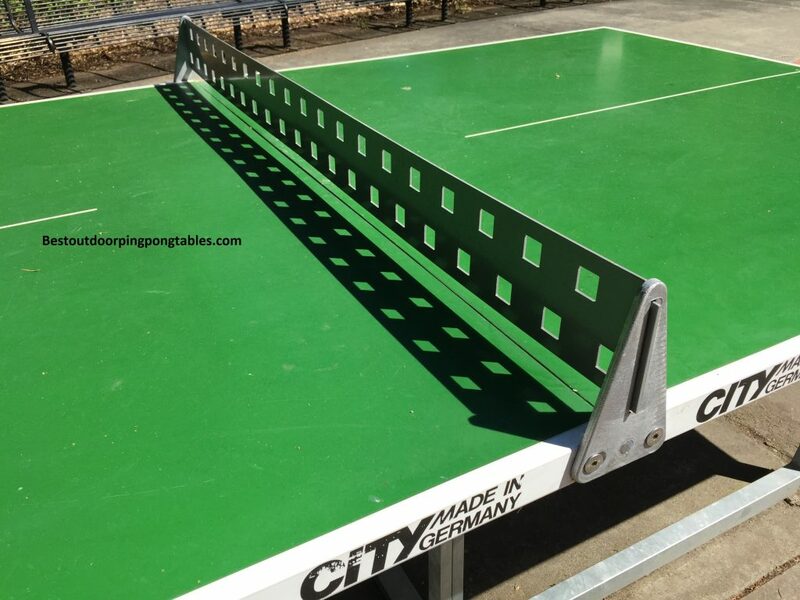 Otherwise, the JOOLA City outdoor ping pong table is the perfect choice for city parks. The only table we have used that is better is the Cornilleau Park Outdoor – which is priced at $4600. Assembly – Putting the table together will take more brawn than brains. Due to the extreme weight of the table (over 400 lbs), you will want a second pair of hands to get the tabletop onto the undercarriage. Overall the assembly goes easy and shouldn’t take more than 1 hour. You will see you can also secure the frame to the ground. Disadvantages – Perhaps you can find 2 issues with the table. The first is that it’s not meant to be moved around. Therefore, you need to make sure you are happy with the location since once it’s secured to the ground, it’s not going anywhere. The table is weatherproof so you won’t have to worry about storing it in the winter months. The price can be considered a disadvantage to some. In talking to cities that purchase this for parks and outdoor recreational areas, they are completely happy with the purchase. The next step down would be the JOOLA Externa or even the Cornilleau 510. 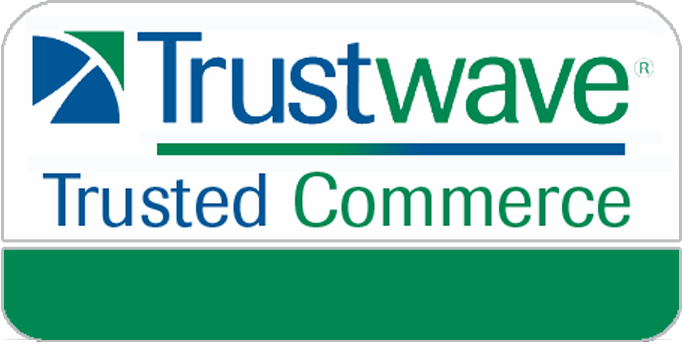 CALL US FOR THE LATEST PRICING AND SPECIALS!